Students will be returning to school during the second week of August and that means time to go shopping for school supplies. This year we have a Back-to-school Sales-Tax Holiday that runs from August 3rd to August 5th. Each year the items on the list have changed and the max cost for those items have also changed. 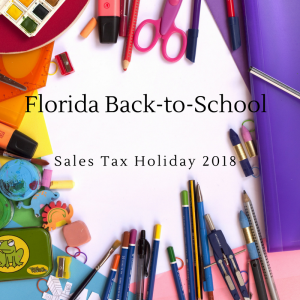 The best resource for up-to-date information is the http://www.floridarevenue.com/backtoschool Florida revenue website. They have a pdf that you can download which will show the items included. Some of the things to remember that each item of clothing cannot cost over $60 and the school supply that you purchase cannot be over $15. Surprisingly, staplers, printing paper, and correction fluid are not on the list of tax-exempt items.